Whitman Sweeps Battle of Bethesda on Senior Night! Posted on February 4, 2018 by cindyboinis | Comments Off on Whitman Sweeps Battle of Bethesda on Senior Night! The much anticipated Battle of Bethesda had finally arrived. This historically has been the last wrestling match of the regular season and determines which Bethesda school will have bragging rights. Many of the wresters on these teams know each other through youth and off season wresting leagues, as well as the proximity of the schools themselves, so it is always a fun season ending event. 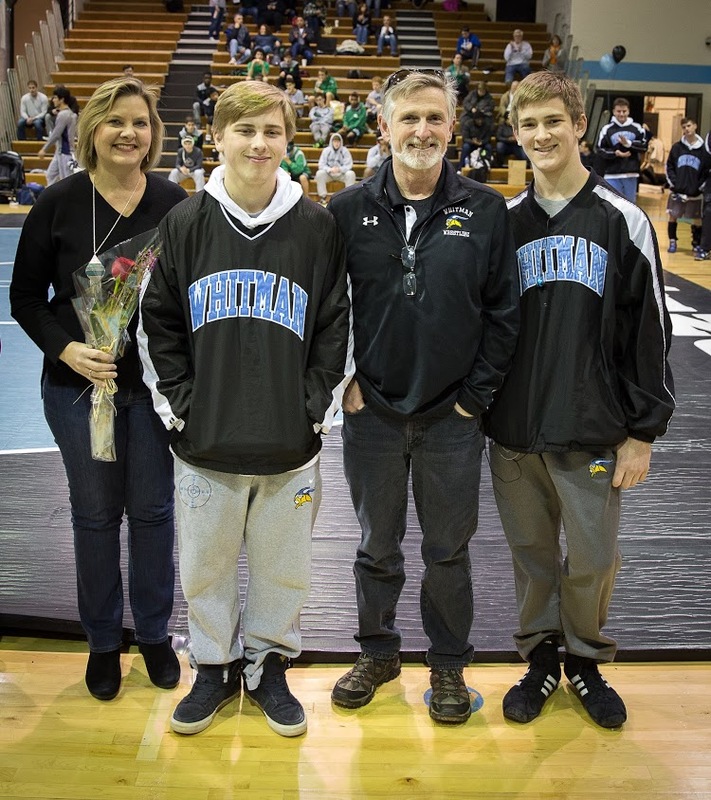 Being the last home meet it was also Whitman’s Senior Night. The three Viking seniors, Clark Boinis, John Luke Iglesias and James Mackall had all waited 4 long years for a chance to capture this coveted title. While Whitman fielded some very competitive teams the previous three years, none were ever able to claim this title. The Viking lost both contests in 2014-15, beat WJ and lost to BCC in 2015-16, and lost again to both teams last year. To add to the excitement all three Bethesda teams had a chance to advance to the regional duals tournament next week if they could win both their matches. BCC came into the evening at 9-3, our Viking squad had a record of 8-4, and WJ came in with a record of 7-5. Knowing everything was on the line the Whitman gym was packed with fans, including some legacy Whitman wrestling families who had come out to cheer on the Vikes. A big shout out to the Bambergers (James 2016), the Fentons (Mitch 2016), the Calders (Jack 2014), and the Sharbaughs (Steve 2014, Will 2007) for their continued support of our wrestling program. The first match of this tri-meet featured the BCC Barons against the WJ Wildcats. The Barons were able handle the Wildcats in a rather convincing manner by a score of 45 to 24. After the conclusion of the first meet the Whitman Senior Night Ceremonies were held. Coach Manon spoke highly of our three seniors who not only all had outstanding wrestling careers but also achieved academic success with weighted GPAs all in excess of 4.2. After the ceremony was over the varsity squad left the gym momentarily and re-entered for the last time to the blaring sound of 300 Violin Orchestra. The captains then meet at center mat and fired up their team one last time to try and capture the Battle of Bethesda title. The Vikings first meet would be against the Wildcats. The first match was to be at heavyweight and John Luke Iglesias was bumped up to wrestle this match. As we would soon learn Coach Manon had rearranged his “bigs” lineup with Yussef Zaki cutting down to 182, Tom Wilmarth moving to 220 and Thomas Santora stepping up to 195. These moves turned to be well thought out and would pay dividends as evening progressed. John Luke started the meet off on a positive note by recording a technical fall in the third period. WJ then took our forfeit at 106 and then went on to record three falls at 113, 120 and 126. This brought the team score to an unfavorable 5-24 when Clark Boinis ran out on the mat at 132 to stop the bleeding. Clark manhandled his opponent in the first period and was leading by points when he pinned him midway through the second period. Mathew Lindstrom was now back in the lineup at 138 and continued his standout season by pinning his WJ opponent in the second period as well. Max Gersch also was back in form and turned in a nice pin in the first period. This brought the Vikings to within one point of WJ, 23-24. Whitman then lost by fall at 152 and was trailing by 7 with just five matches left. Fortunately for the Vikings next up were two (of our three) ranked sophomore sensations, John Mackall at 160 and Sebastian Turkewitz at 170. John pinned his opponent early in the second period and Seb managed a major decision outscoring his opponent by 9-1. These wins set the tone for Yussef Zaki, who now at 182, overpowered and pinned his opponent in the second period. Whitman lost a tough match at 195 and now led by only 3 points going into the final match at 220. Tom Wilmarth then stepped out on the mat ready to wrestle, but WJ never sent anybody out to face Tom and he collected a forfeit. The final score was Whitman 45 WJ 36. Step one was now complete, we now had to beat the deep and well coached BCC squad to claim our first Battle of Bethesda title in four years. The Vikings-Barons match started at 106 with Whitman once again forfeiting this weight class. At 113 we fared no better and lost by fall in the first period. Our third sophomore sensation, Peyton Casamento, was then called upon to turn this contest around. Having attended Battle of Bethesda meets even before entering high school, Peyton understood what was at stake. Peyton did not let his team down and pinned his BCC opponent in the first period. Whitman then lost by fall at 126 bringing the team score to 6-18. BCC then chose to shift their lineup around a bit and wrestle third ranked Eli Guttentag up to 132 to face Clark Boinis. This shift did not work out so well for BCC as Clark outwrestled Eli for a Vikings win bringing the score to 9-18. The Viking then lost the next two matches at 138 and 145 by major and fall respectively. Sang Hanna was then called upon to enter the fray at 152. Sang wrestled well throughout the first three periods which ended in a 5-5 tie. When OT rolled around Sang was ready for sudden death and, (like déjà vu at Sherwood earlier in the week), Sang managed a takedown to win the match and the valuable three points for his team. Another clutch performance by Sang, well done! John Mackall and Sebastian Turkewitz at 160 and 170 then both dispatched their opponents by fall and points respectively. Their combined effort helped the Vikes climb back to within 3 points of BCC, 21-18. Yussef Zaki was up next facing one of BCC’s (and the county’s) top ranked senior wrestlers at 182, Rhys Cohen. Yussef took command of the match immediately and never trailed the entire time recording a 5-2 win and garnering 3 points. 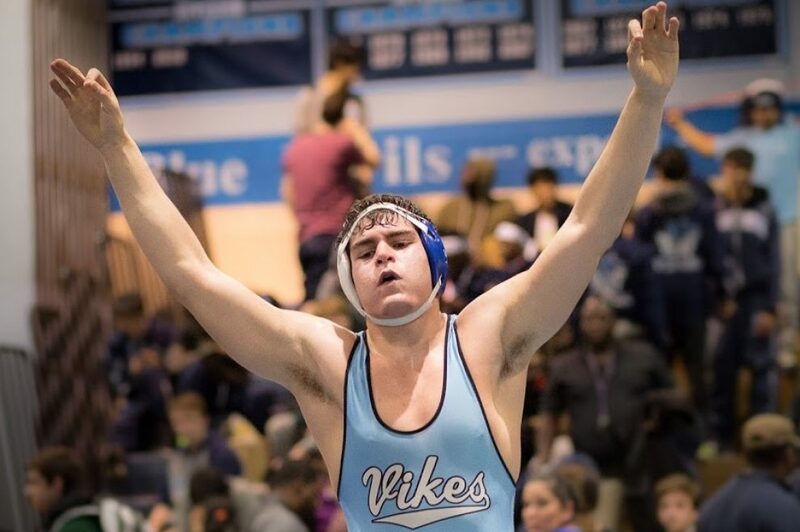 The Viking then lost at 195 by fall and were now down 24-34 with just two matches remaining. It would all come down to Whitman’s two big men, who together had the fate of the Battle of Bethesda in their hands. With the Vikings down by 10 there would be no room for error. First up was Tom Wilmarth at 220. Tom did not let his teammates down and won by fall in the first period bringing Whitman to within just four points of BCC. John Luke was up next at heavyweight and he was giving up a considerable amount of weight to his BCC opponent. The first period ended with a 2 point Whitman lead. 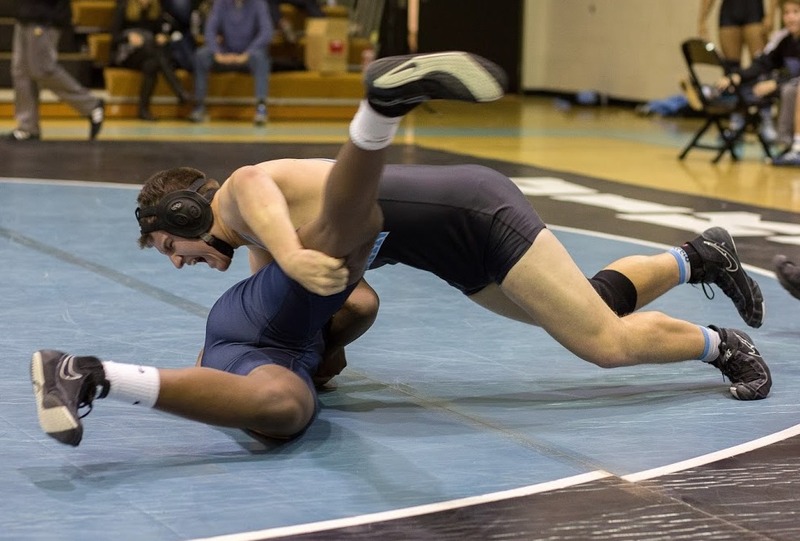 However, John Luke managed another takedown in the second period and eventually pinned his opponent………the entire Whitman team, coaches, and fans all erupted into shouts of joy and euphoria. The final score was Whitman 36 BCC 34! After four long years seniors Clark Boinis, John Luke Iglesias and James Mackall had finally won the Battle of Bethesda. Together with their teammates and coaches they all now had Bethesda bragging rights. Additionally, our three seniors had a magnificent capstone event to add to their Whitman wrestling careers. The team would learn later that three teams were now tied for the 3rd and 4th seeds at the regional duals. All three teams, Whitman, BCC and Northwest had identical records of 10-4. The first tie breaker was head to head competition. This was a draw with Whitman beating BCC, BCC beating Northwest and Northwest beating Whitman. The second tiebreaker was determined to be the point differential of the three common matches. When this was taken into consideration BCC and Northwest had the edge over the Vikes and thus those two advanced to the duals. Nonetheless, the Whitman Vikings had a great 2017-2018 season. The team record was greatly improved over the previous 2016-2017 season which resulted in a final record of 5-9. Our team at the beginning of this season only had two ranked wrestlers, we now have six. Our JV squad won the vast majority of their matches and is poised to contribute in the future. This team is peaking at the right time and many of our grapplers are well positioned to make deep runs not only at the JV tournament but also at the County, Regions and States. Our collective hats are off to Coaches Manon, Sharbaugh and Dahlstrom for their teaching skills and molding this team into the major county contender it is today.